Steve Hansen believes New Zealand's clash with England on Saturday is bigger than their drawn series against the British and Irish Lions last year. 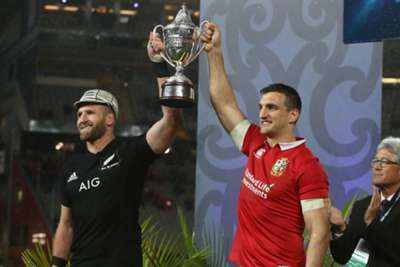 The All Blacks were denied victory by a touring Lions side following a dramatic draw in the third Test as Owen Farrell - one of several England players involved - kicked a late penalty. And Hansen says that disappointment has given the upcoming November international between New Zealand and Eddie Jones' side an added edge. "I think this is even bigger, actually," said Hansen, comparing the Twickenham match to the 2017 Lions tour. "I think the Lions tour has made it bigger because we weren't successful. "In only drawing the series, that wasn't successful to us. That's made this week have a sharper edge to it, which is good. It's been four years since the #AllBlacks swept England 3-0 on their tour to New Zealand. "You've got to be reasonably stupid if you can't work out this is going to be big. There's 80,000 people there, it's all over the papers, everyone's talking about it, you can't get a ticket. "You'd have to be on holiday, I reckon, if you didn't work out that this is going to be big. And we haven't got anybody on holiday this week." Hansen is under no illusions about the scale of the task either, adding: "I don't know who's writing them off - it would be foolish to do that. But does it put pressure on us? No. "There's already pressure on us, the one constant thing about being in the All Blacks is you're under pressure. You're expected to win every Test match you play and not only win it, win it really, really well. "Once you come to realise that then life becomes a little easier and it does, at times, give you an advantage. When other teams get put under pressure of having to win big games, they haven't experienced that as much as maybe we have."